Please use the comments at the bottom of most pages in this site. The original creator of the site decided to move on to explore other areas, and so he put the site up for sale in 2012. I purchased the domain name, but none of the extensive material that had been so arduously amassed by the previous webmaster came along with the site. In the spring of 2013, I began to work on this new site. The value of Orgone.org will in a large part depend on the comments that readers can make on almost every page. I will moderate the comments, and use them as a forum for public exchange, consistent with the original vision of Orgone.org. All images on this site are by J. Mitchell unless otherwise noted. Information presented on this web site is considered public information and may be distributed or copied, appropriate byline/photo/image credits requested. Creative works within the site remain our property and may not be used without permission. This work is licensed under a Creative Commons Attribution 3.0 Unported License. 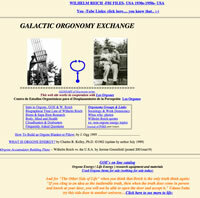 Please note that as of March 2013, Orgone.org is a new website with no affiliation with the previous website mentioned above. Who am I, you may wonder. I am a curious person who was attracted to Reich's ideas from my student days. Early on in the 1960's I read his work and was moved to come to Rangeley Maine in 1970 to seek out people who actually had met and worked with Dr. Reich. I became convinced that he was a sincere soul who had been dealt a difficult hand by life. I built accumulators in the 1980's and used them for myself and my friends. I spent two years in Graduate School in a Health Physics discipline trying to do some original research on the interaction between accumulators and nuclear material. I was not supported in this work and was told to give up my work with accumulators and concentrate on running the 10 MeV linear accelerator. Feeling an urge to travel, I left academia and wound up living, teaching and studying in Japan, Mexico, Korea, Egypt, Chile, India and Germany. Everywhere I went, I looked at the societies and the people in whom I was in contact using an understanding that was framed in basic Reichian principles. After 25 years of wandering around the world, I recently returned to Maine. I have built some more accumulators and use one on a daily basis. I am convinced by my personal experience that there is a positive health benefit that comes from the use of an accumulator, and hopefully I will be able to share some of my thoughts and experiences with you, the reader, on this web site.